APPLICATIONS OF THE STR IN THERMODYNAMICS BLANUŠA’S TRANSFORMING FORMULAE (BTF, 1947) FOR Q and Q0 ; T and T0 Q0 and T0 (in the rest frame); Q and T (for the moving frame) are quantitatively and conceptually different w.r.t. Planck’s (based on the variational principle), and Einstein’s relations (directly from the Lorentz transformation) in 1907. 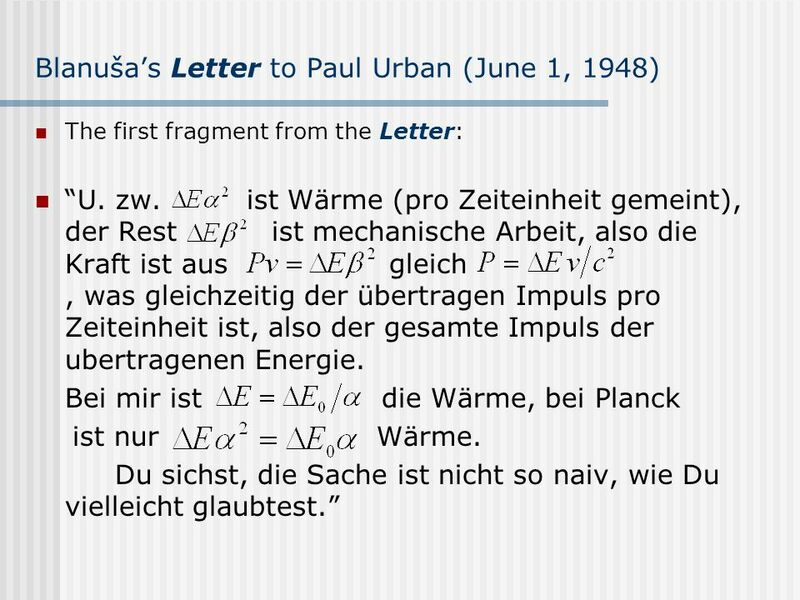 W. Pauli claimed Planck’s and Einstein’s expressions were correct, and thus used them unaltered in the famous book on the Theory of Relativity (1921), and in his later works. 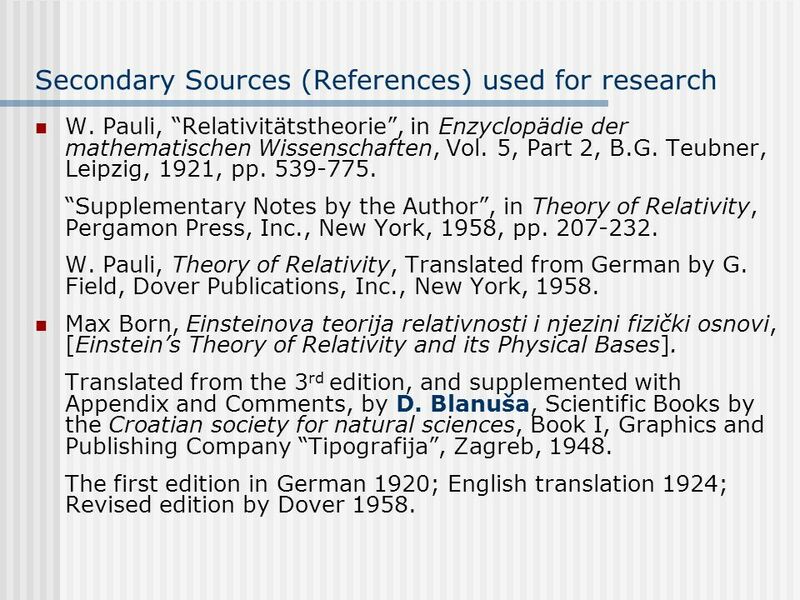 Unfortunately, Blanuša did not leave his Autobiographical Notes like A. Einstein did with Autobiographisches (at the age of 67). However, Blanuša left his Letters to W. Pauli! Unfortunately, Pauli did not encourage Blanuša to publish the formulae in the world-known journal. 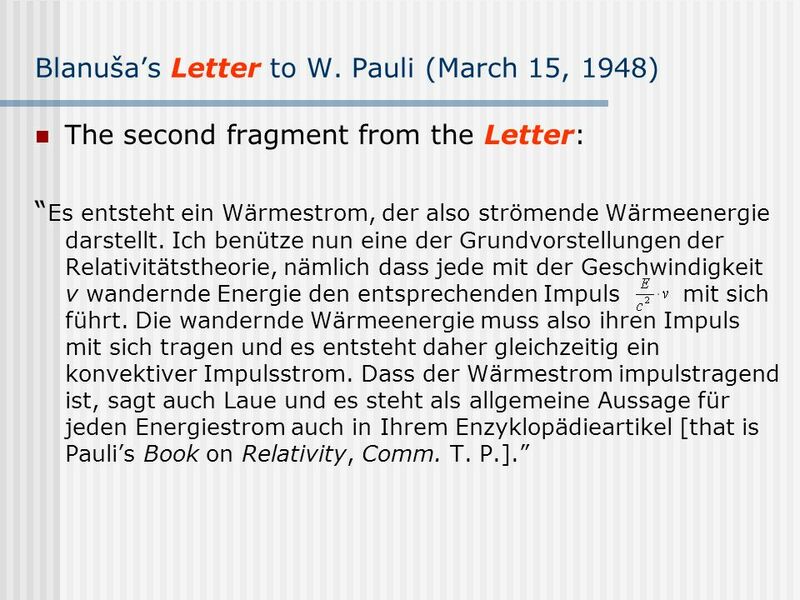 “This Pauli is a well-oiled head” (A. Einstein on W. Pauli (1900 – 1958), Nobel laureate, 1945). 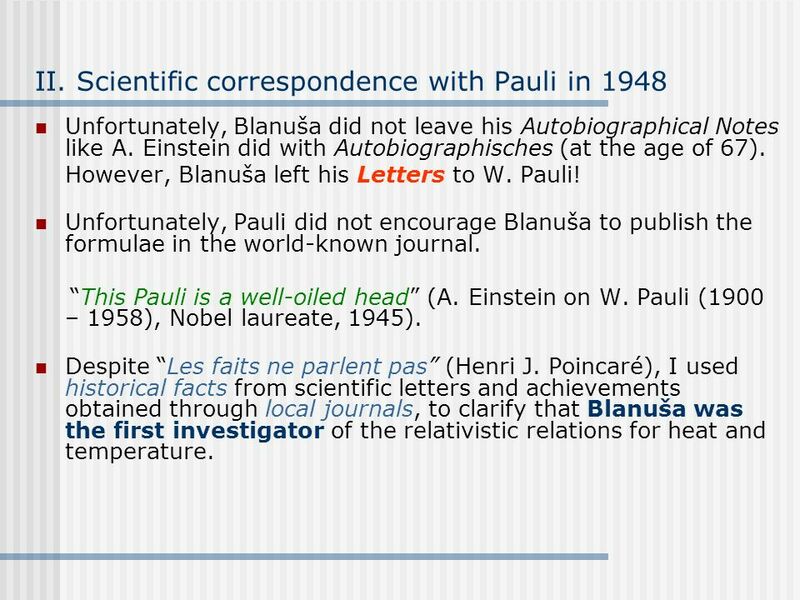 Despite “Les faits ne parlent pas” (Henri J. Poincaré), I used historical facts from scientific letters and achievements obtained through local journals, to clarify that Blanuša was the first investigator of the relativistic relations for heat and temperature. W. Pauli, “Relativitätstheorie”, in Enzyclopädie der mathematischen Wissenschaften, Vol. 5, Part 2, B.G. Teubner, Leipzig, 1921, pp “Supplementary Notes by the Author”, in Theory of Relativity, Pergamon Press, Inc., New York, 1958, pp W. Pauli, Theory of Relativity, Translated from German by G. Field, Dover Publications, Inc., New York, 1958. Max Born, Einsteinova teorija relativnosti i njezini fizički osnovi, [Einstein’s Theory of Relativity and its Physical Bases]. Translated from the 3rd edition, and supplemented with Appendix and Comments, by D. Blanuša, Scientific Books by the Croatian society for natural sciences, Book I, Graphics and Publishing Company “Tipografija”, Zagreb, 1948. The first edition in German 1920; English translation 1924; Revised edition by Dover 1958. Blanuša’s Letter (in German) to the honest Professor W. Pauli, dated on March 15, 1948, sent from the Tehnical Faculty, Kačićeva street 26, Zagreb. Text typed by type writer with Blanuša’s original corrections inserted. Total 7 pages of the text including formulae. 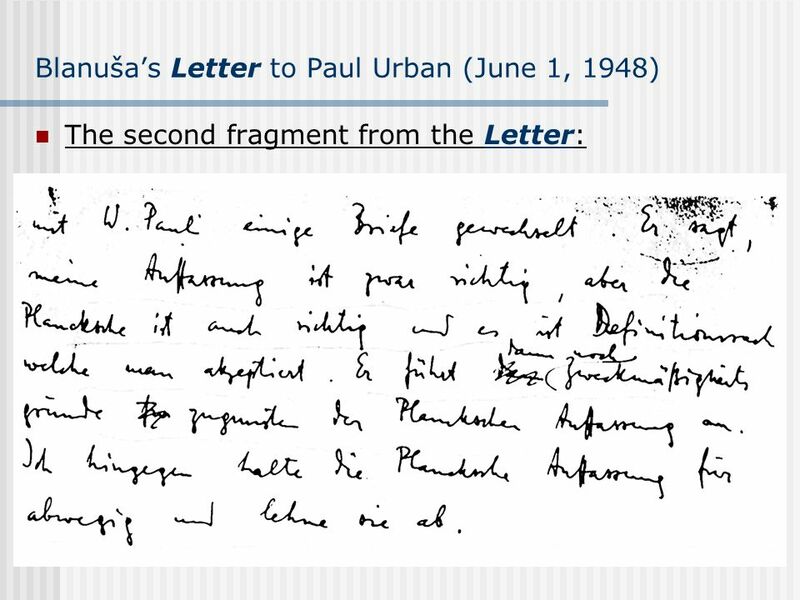 Blanuša’s Letter (in German) to Paul Urban in Graz, Univerzitätplatz 5, dated on June 1, Letter is a draft handwritten by Blanuša. Total 4 pages of Blanuša’s writing. The correspondence was long, including Urban’s responses. 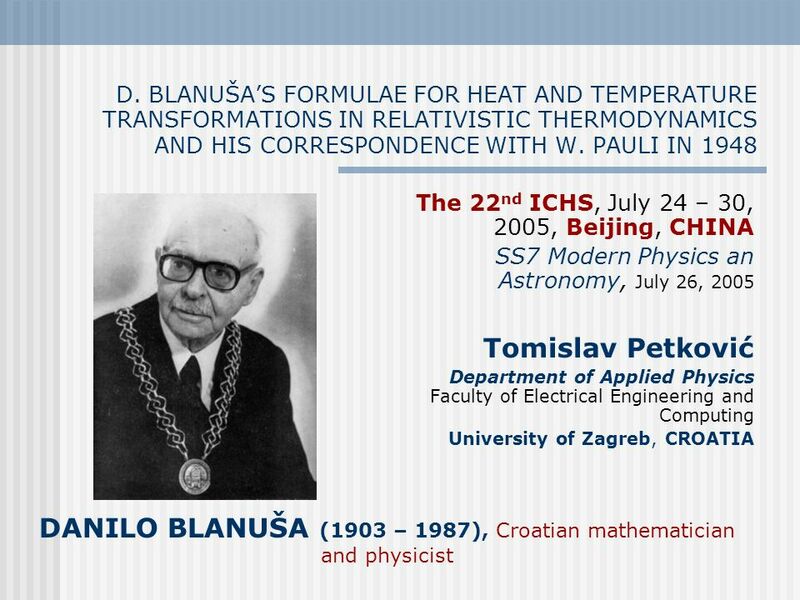 Two scientific colloquia on the occasion of the 100th anniversary of the birth of academician D. Blanuša: HAZU, Zagreb, Croatia (the 1st colloquium, May 29, 2003); FER, Zagreb, Croatia (the 2nd colloquium, July 1, 2003). Heinrich Ott, Lorentz-Transformation der Wärme und der Temperatur, Zeitschrift für Physik 175, 70–104 (1963). H. Arzeliès, Transformation relativiste de la température et de quelques autres grandeurs thermodynamiques, Il Nuovo Cimento, Vol. XXXV, N. 3 (1965) 792–804. 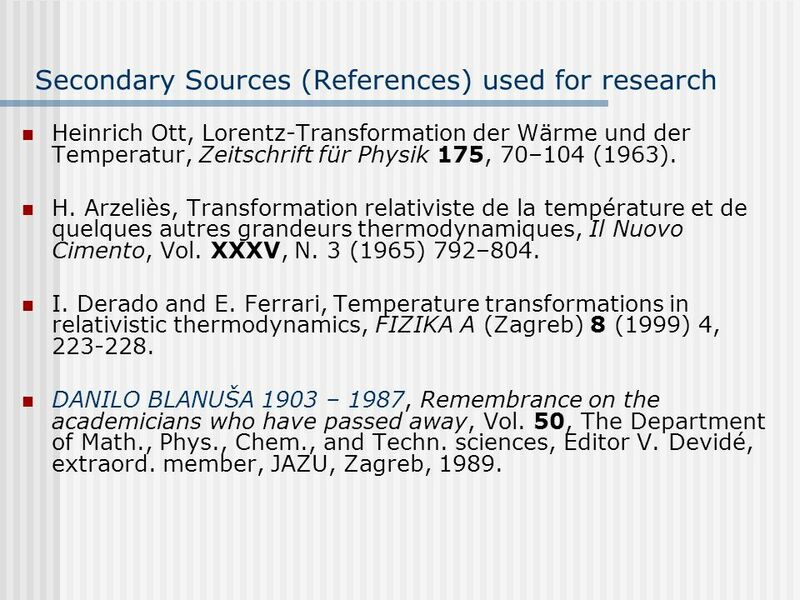 I. Derado and E. Ferrari, Temperature transformations in relativistic thermodynamics, FIZIKA A (Zagreb) 8 (1999) 4, DANILO BLANUŠA 1903 – 1987, Remembrance on the academicians who have passed away, Vol. 50, The Department of Math., Phys., Chem., and Techn. sciences, Editor V. Devidé, extraord. member, JAZU, Zagreb, 1989. Planck’s (i.e. 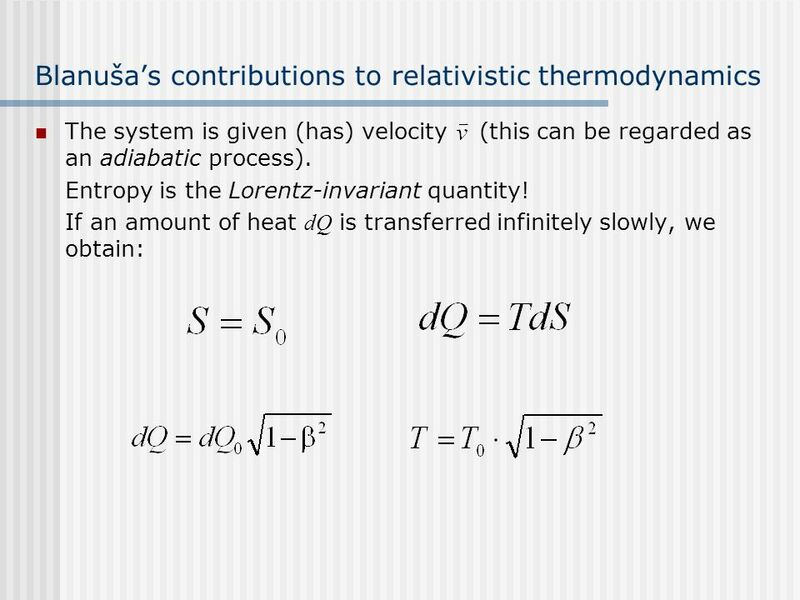 Pauli’s) formulae for heat and temperature for the transition to a moving frame, are as follows: The formulae were derived by combining the transforming relations for volume (V and V0), pressure (p and p0), total momentum and energy (E and E0), the amount of heat dQ transferred to the system, and the work dA done by the external force on the system. 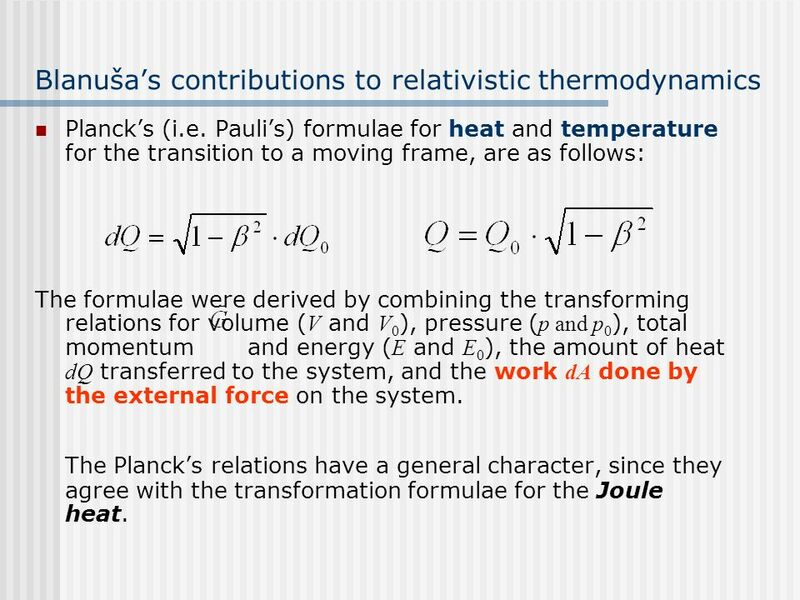 The Planck’s relations have a general character, since they agree with the transformation formulae for the Joule heat. Danilo Blanuša, Sur les paradoxes de la notion d’énergie, Glasnik Mat.–Fiz. i Astr., Ser. II 2 (1947), str. 249 – 250. Danilo Blanuša, O relativističkoj termodinamici [On the relativistic thermodynamics], Prvi kongres mat. i fiz. FNRJ [The First Congress of Math. and Phys. of the FNRJ], Bled 1949, Naučna knjiga[Scientific Book], Beograd 1951. [Belgrade 1951], str. 235 – 240. 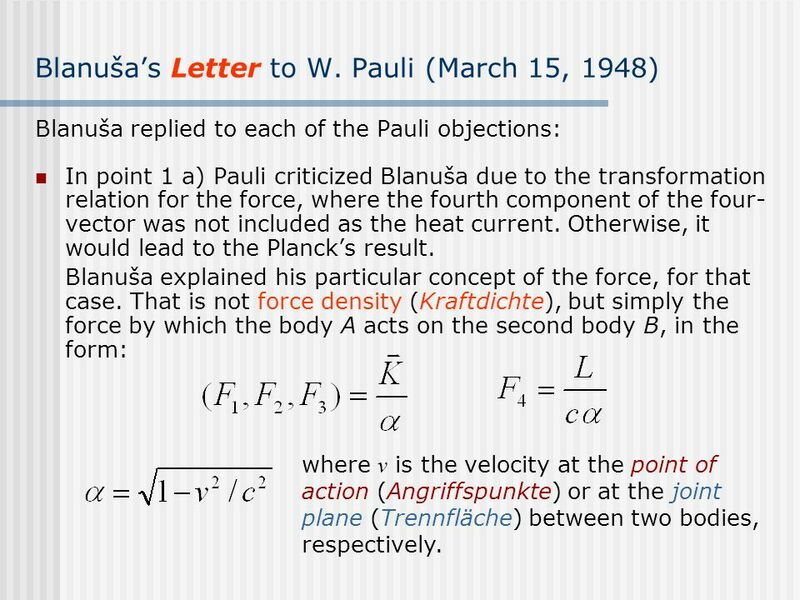 Blanuša replied to each of the Pauli objections: In point 1 a) Pauli criticized Blanuša due to the transformation relation for the force, where the fourth component of the four-vector was not included as the heat current. Otherwise, it would lead to the Planck’s result. Blanuša explained his particular concept of the force, for that case. That is not force density (Kraftdichte), but simply the force by which the body A acts on the second body B, in the form: where v is the velocity at the point of action (Angriffspunkte) or at the joint plane (Trennfläche) between two bodies, respectively. Blanuša warned Pauli that in his book (German edition) in the formula (219) the factor 1/ was mistakenly omitted in the fourth component. In the new editions (for ex., by Dover) this mistake was fixed, but even though Blanuša was the first to notice it, he was never given credit. For the rest frame (v = 0), it follows that the components of the questionable four-vector should be , which unambiguously would lead to Planck’s relations. 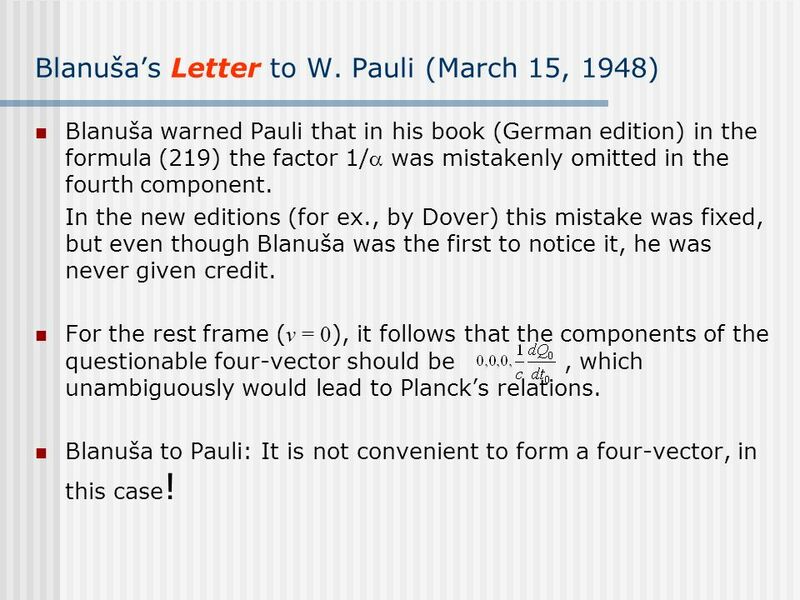 Blanuša to Pauli: It is not convenient to form a four-vector, in this case! 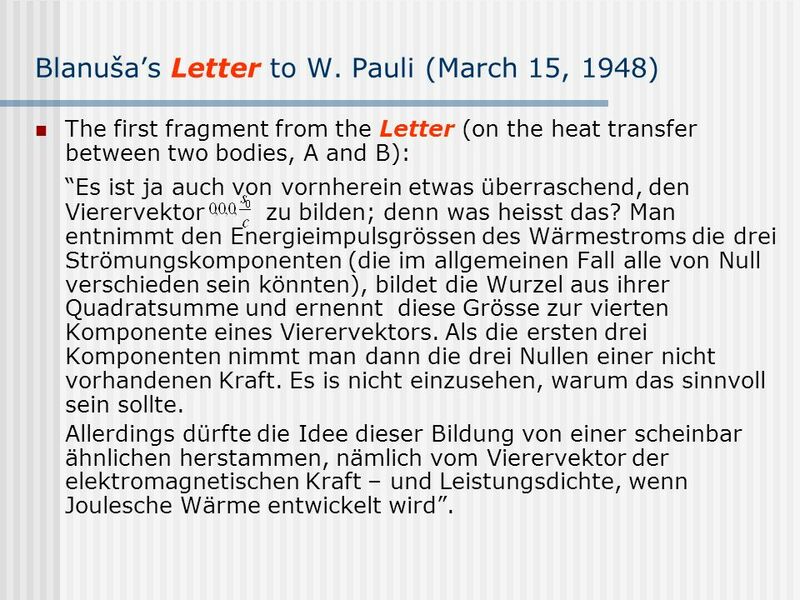 The first fragment from the Letter (on the heat transfer between two bodies, A and B): “Es ist ja auch von vornherein etwas überraschend, den Vierervektor zu bilden; denn was heisst das? Man entnimmt den Energieimpulsgrössen des Wärmestroms die drei Strömungskomponenten (die im allgemeinen Fall alle von Null verschieden sein könnten), bildet die Wurzel aus ihrer Quadratsumme und ernennt diese Grösse zur vierten Komponente eines Vierervektors. Als die ersten drei Komponenten nimmt man dann die drei Nullen einer nicht vorhandenen Kraft. Es is nicht einzusehen, warum das sinnvoll sein sollte. Allerdings dürfte die Idee dieser Bildung von einer scheinbar ähnlichen herstammen, nämlich vom Vierervektor der elektromagnetischen Kraft – und Leistungsdichte, wenn Joulesche Wärme entwickelt wird”. It follows the components satisfy conditions (the properties of the tensor): (symmetry property of tensor) = velocity of the energy current Momentum, which flows per unit area per unit time (together with energy current): By transforming Bik tensor into the moving frame S, Blanuša obtained the corresponding quantities in that frame (p, i w). 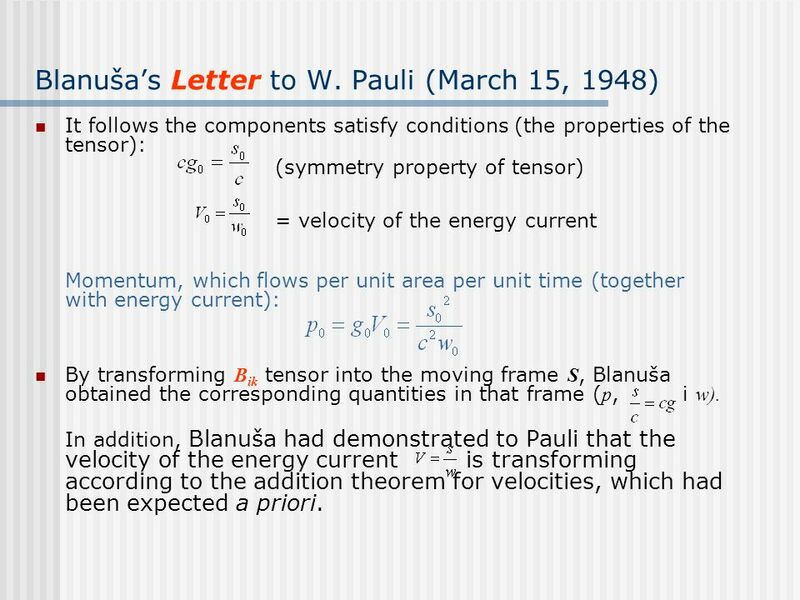 In addition, Blanuša had demonstrated to Pauli that the velocity of the energy current is transforming according to the addition theorem for velocities, which had been expected a priori. 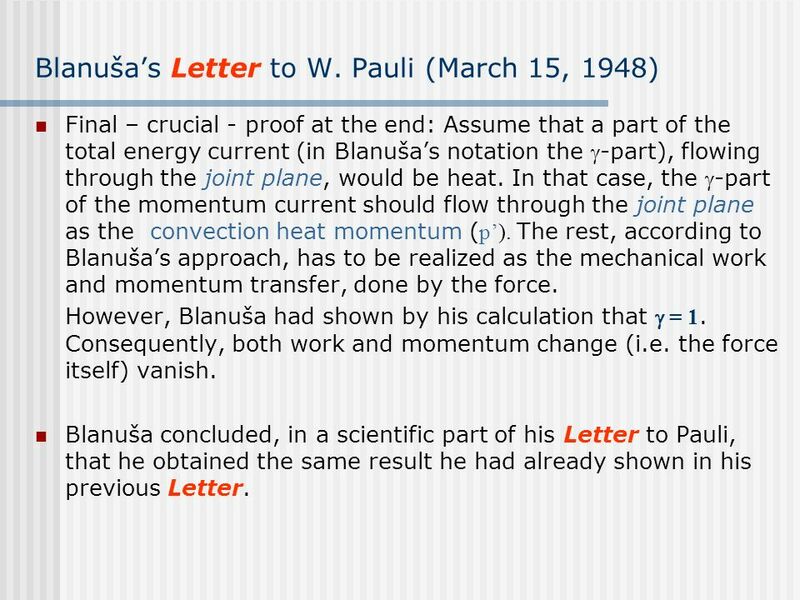 Final – crucial - proof at the end: Assume that a part of the total energy current (in Blanuša’s notation the -part), flowing through the joint plane, would be heat. In that case, the -part of the momentum current should flow through the joint plane as the convection heat momentum (p’). The rest, according to Blanuša’s approach, has to be realized as the mechanical work and momentum transfer, done by the force. However, Blanuša had shown by his calculation that  = 1. Consequently, both work and momentum change (i.e. the force itself) vanish. 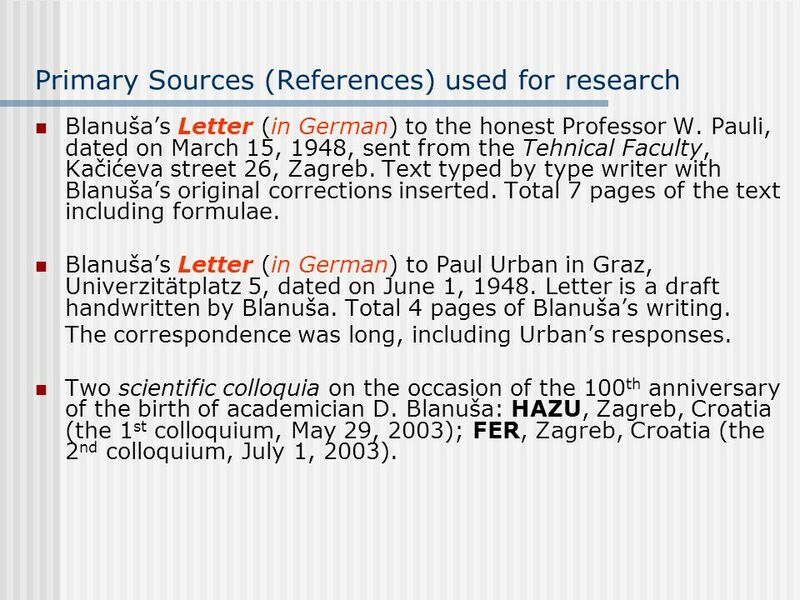 Blanuša concluded, in a scientific part of his Letter to Pauli, that he obtained the same result he had already shown in his previous Letter. 1. 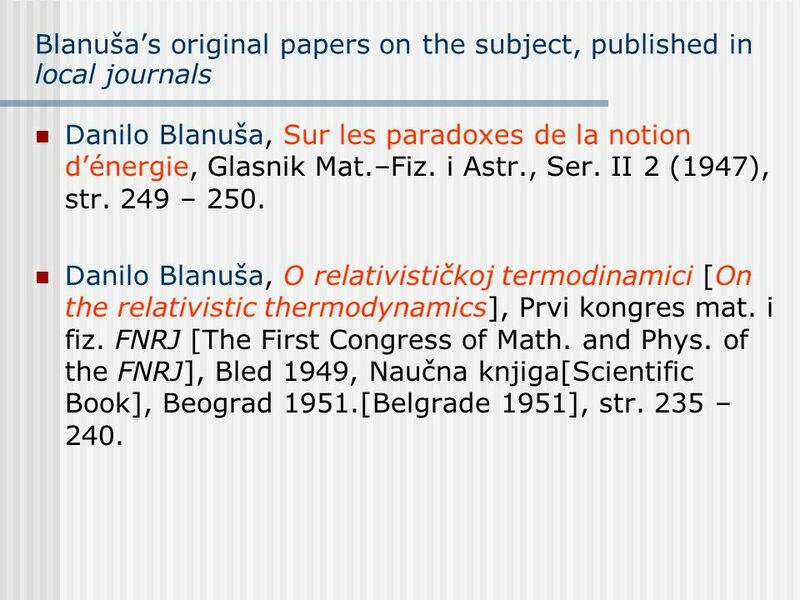 Blanuša made the fundamental error of not publishing his formulae for heat and temperature transformation in relativistic thermodynamics in the world-known journals of physics in those times. His contributions to the STR and thermodynamics were left only locally recognized! 2. 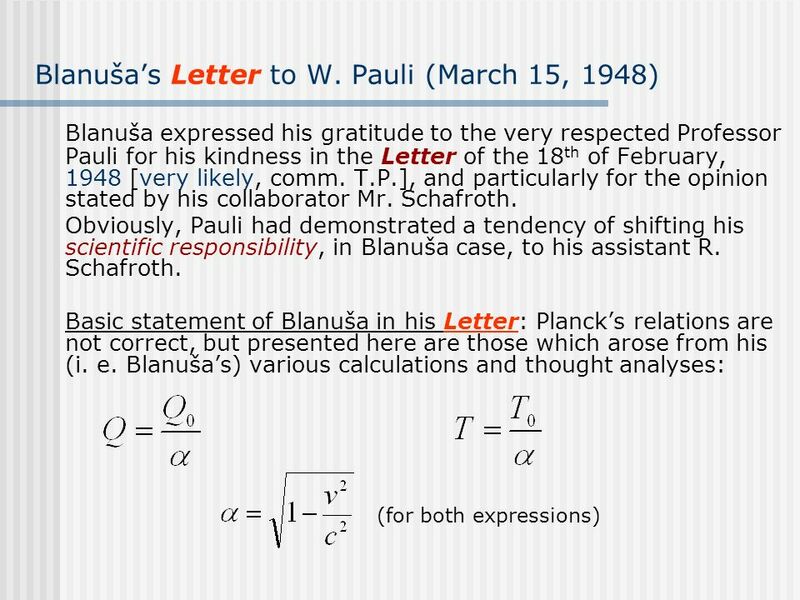 Responsibility of the scientist (“Verantwortung des Wissenschaftlers”) Blanuša understood, in this case, that the most prominent physicists (founders) in the field of relativity had to be first informed, in order to provide their agreement and justification for his formulae. At that time in Europe it was Pauli, rather than Einstein, who was occupied in the USA with other problems and questions. 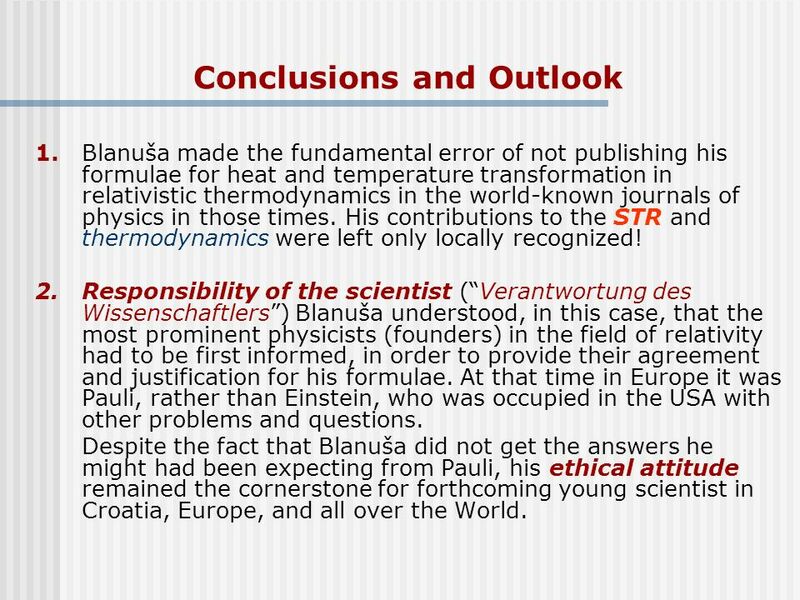 Despite the fact that Blanuša did not get the answers he might had been expecting from Pauli, his ethical attitude remained the cornerstone for forthcoming young scientist in Croatia, Europe, and all over the World. 3. Would it be, perhaps, better that Blanuša, in his Letter, had referred to the important footnote on page 86 of Pauli’s book [Dover ed. 1958], dealing with Planck’s original comment on the generalization of the Minkowski tensor Sik to other [non-electromagnetic] forms of energy, which can lead to “unduly perturbed” paradoxical situations? 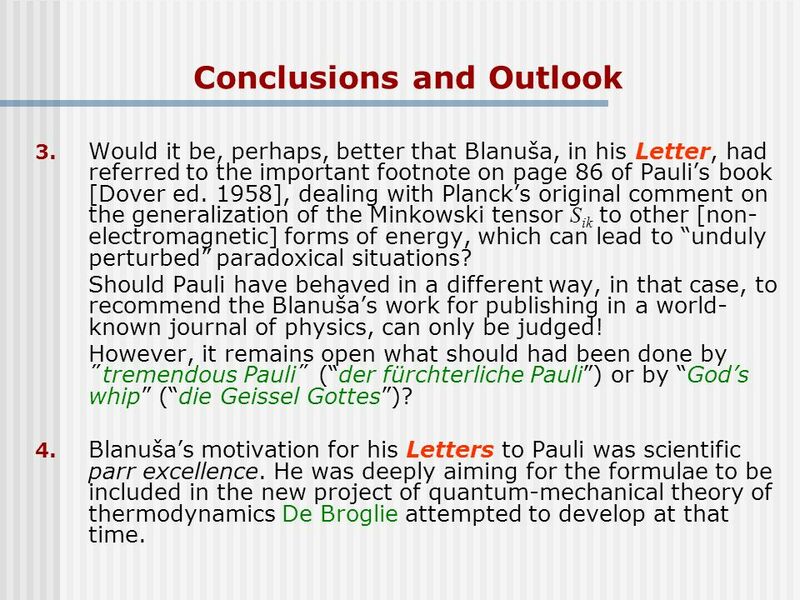 Should Pauli have behaved in a different way, in that case, to recommend the Blanuša’s work for publishing in a world-known journal of physics, can only be judged! However, it remains open what should had been done by ˝tremendous Pauli˝ (“der fürchterliche Pauli”) or by “God’s whip” (“die Geissel Gottes”)? 4. Blanuša’s motivation for his Letters to Pauli was scientific parr excellence. He was deeply aiming for the formulae to be included in the new project of quantum-mechanical theory of thermodynamics De Broglie attempted to develop at that time. 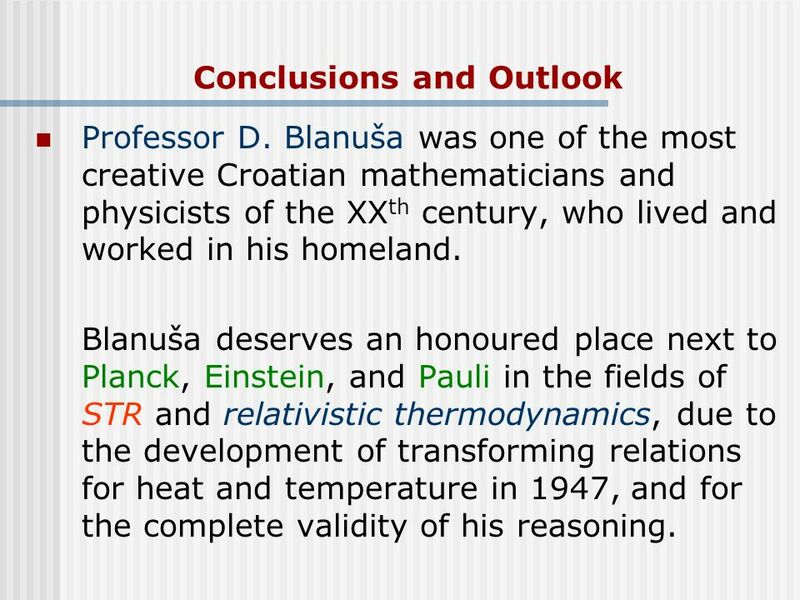 Professor D. Blanuša was one of the most creative Croatian mathematicians and physicists of the XXth century, who lived and worked in his homeland. 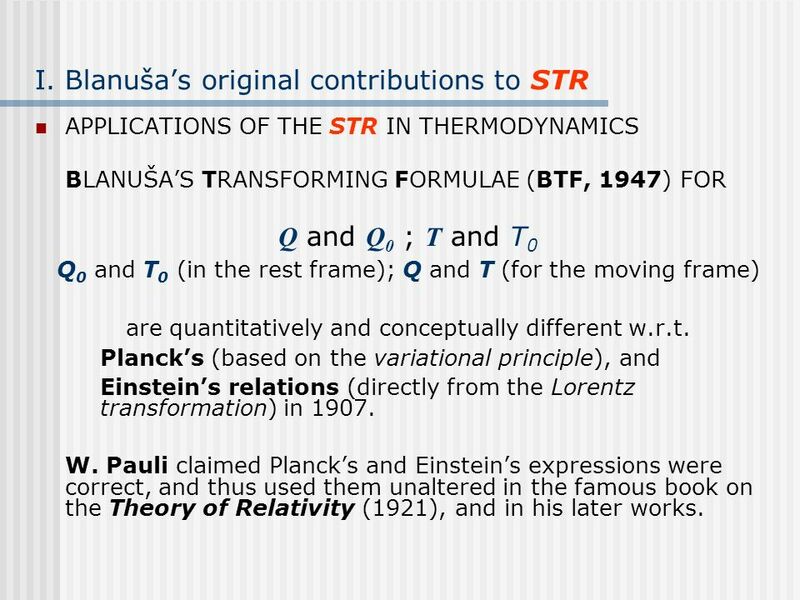 Blanuša deserves an honoured place next to Planck, Einstein, and Pauli in the fields of STR and relativistic thermodynamics, due to the development of transforming relations for heat and temperature in 1947, and for the complete validity of his reasoning. 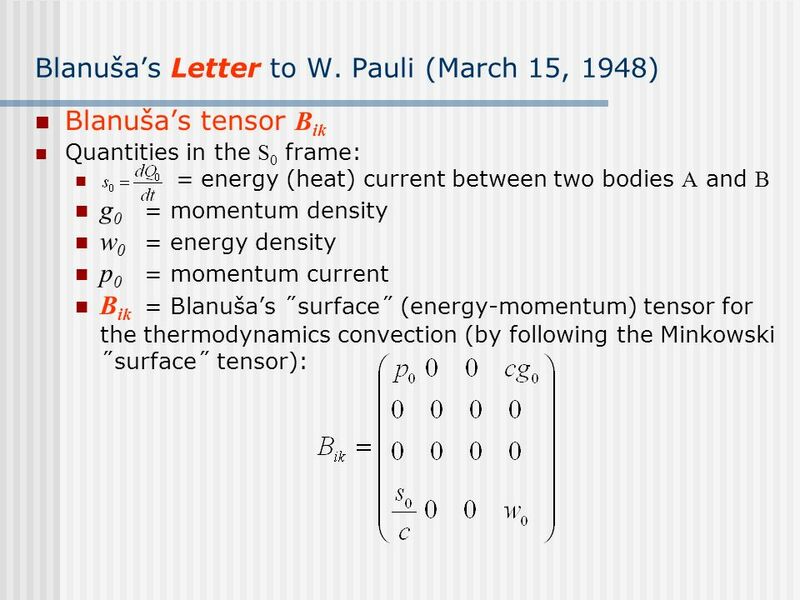 Download ppt "DANILO BLANUŠA (1903 – 1987), Croatian mathematician and physicist"
Quantum Mechanics AP Physics B.
Marlyne Montero Villareal MSciEd Physics II July 16, 2011 Mass. Lecture 5 The meaning of wave function (c) So Hirata, Department of Chemistry, University of Illinois at Urbana-Champaign. This material has been developed. Boyce/DiPrima 9th ed, Ch 2.8: The Existence and Uniqueness Theorem Elementary Differential Equations and Boundary Value Problems, 9th edition, by William. Answers to your questions ● An issue was that of the conventionality of language.We can quote Wittgenstein: ● An unseren Notationen ist zwar etwas. Hot topics in Modern Cosmology Cargèse - 10 Mai 2011. Electrostatic energy of a charge distribution. Q Q’ e Move charge Q to position Q’ creates propagating ‘kink’ in the electric field, which affects the motion of electron e.
1 Electromagnetism We want to apply the reaction theory developed in the first few lectures to electronuclear interactions. It is worthwhile reviewing. An Essential Engineering for Human (Internal & External) Comforts…… P M V Subbarao Professor Mechanical Engineering Department I I T Delhi ORIGIN & SCOPE. Non-Localizability of Electric Coupling and Gravitational Binding of Charged Objects Matthew Corne Eastern Gravity Meeting 11 May 12-13, 2008.